Never set up and tear down your mixer, amplifier, wireless microphones and tape and CD recorder again! Mobile equipment rack allows you to move your sound equipment without having to unhook your gear or cables and move it piece by piece. 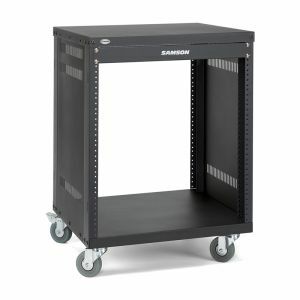 This mobile Pop-up Rolling Console Rack Case equipment rack allows you to move your sound equipment without having to unhook your gear or cables and move it piece by piece! When you need to move your gear simply lock on the durable covers and your equipment will be protected while you move it using the heavy-duty, rolling casters. Exterior: 17 3/4" x 21 1/2" x 22 3/4"
Interior Front Rail to Rear Rail Distance: 21"
Interior Front Rail to Rear Lid: 23 1/2"
Top Section: 19 1/4" x 17 1/2" x 5"
Bottom Section: 19 1/4" x 21"